This excites me more than it probably should, but with the weather getting down to 18 degrees last night I think soup is a must! For me, nothing sounds better than crawling under all 50 of my blankets and turning on Breaking Bad or one the million cooking shows I have recorded and eating a big ole bowl of the soup-of-the-day! I mean warm, hearty soup in your belly, what could possibly be more enjoyable on a freezing winter day? Well, maybe two bowls of chili, a fire, and not having to go to work, but I think I’ll settle for my soup and warm blankets for now! At this point in our relationship I know you understand, or at least accept, my love for soup, but I don’t think we have established that my all time favorite soup has to be….CROCK POT CHILI. 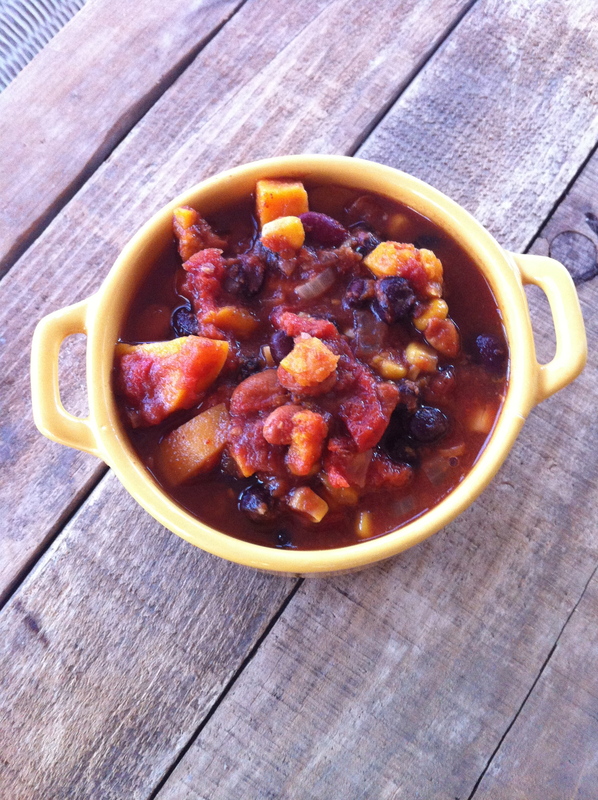 The versatility of chili is only one of the amazing characteristics of this warm, hearty, and comforting soup. The possibilities are endless when creating your perfect chili. You can go spicy, sweet, smoky, Indian, classic, white, Mexican, South West, Southern (full of meat and well everything but the kitchen sink as my mama likes to say), Meatless (obviously my favorite along with all the different spice variations), or even bean-less (I have never been a fan of bean-less chili, mainly because once you leave out the beans it transforms into more of a veggie soup vs. a chili. My brother, however, can put down some bean-less chili!). Now it’s also best to use veggies that are in season, but you can always use whatever combination satisfies your tummy’s deepest desires! 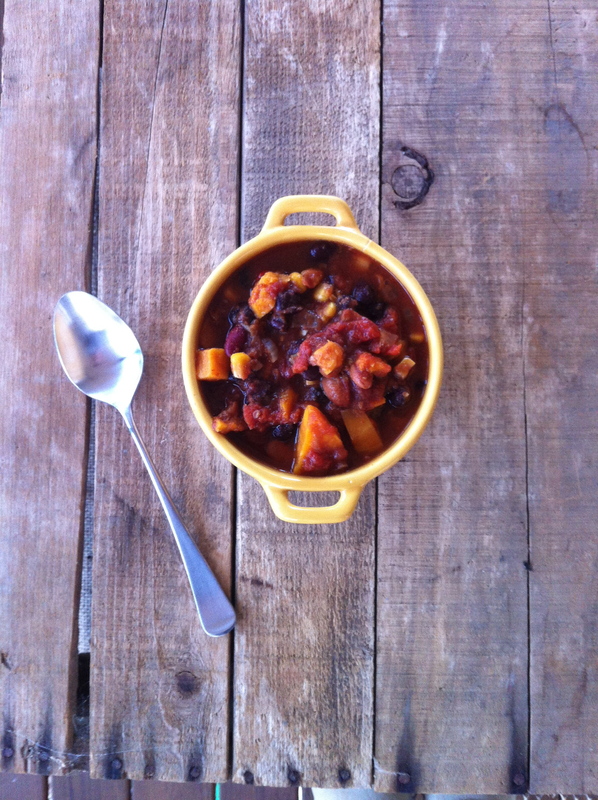 In my case this means a smoky, South West meets Memphis meets Indian spice black bean and sweet potato chili! I know you might be thinking I’m slightly insigne and should just pick one flavor profile, but why when I can have the best of ALL worlds! I love the combinations of corn, black beans, roasted pepper, chili peppers in adobo sauce, and curry powder in a crock pot of goodness. Once the soup has been marrying for about 8 hours in the crock pot of love (the crock pot wears many different hats in our relationship: goodness, love, happiness, right hand man, time saver, oh dad-gum I need to leave in 20 mins but have nothing prepared for dinner tonight, and my favorite ole trusty!) the final product will literally knock your socks off! With ole trusty by my side and a smorgasbord of local fresh veggies, a variety of spices, and for those of us for have lots of organic canned beans and tomatoes on hand (organic and all natural is a MUST if you do go the can route and a quick time saver. Remember, just because you are saving time doesn’t mean you have to sacrifice good quality products), the possibilities are endless and the final product is ALWAYS AMAZING! I’m sure you’re ready to get to the good stuff at this point so here goes! 1-15 oz can of organic low sodium black beans (or simply soak your beans overnight and measure out 15 oz when fully soaked), make sure to rinse and drain before adding to the soup. 1-15 oz can of organic low sodium pinto beans (or simply soak your beans overnight and measure out 15 oz when fully soaked), make sure to rinse and drain before adding to the soup. Roast your red and green bell peppers over an open flame on the stove. Make sure you use long tongs and rotate the pepper until all the skin has a nice black char. Once you have roasted your peppers, wrap them in paper towels and place each pepper in their own sealed plastic baggie. Let these sweet while you prep your other veggies. Finely chop your onion and garlic cloves. Peel and roughly chop your two sweet potatoes. Chop your chili peppers in adobo sauce. Throw all of your prepped veggies into the bowl of a crockpot. Then add the drained and rinsed corn, beans, and the entire can (including the juice) of diced green chilies. Add your diced tomatoes, tomato paste, and vegetable stock. At this point return to your roasted peppers. Taking one out of the bag to work with at a time, use the dampened paper towel to remove a majority of the black char. * I like to leave a little of the char to add to the roasted smoky flavor. Once the char has been removed chop your peppers and add them to the pot. Add all your spices and give it a good mix. Here is where you can taste your mixture and decide if you need to add a little extra spice love. Cover your chili and let it cook on low for 8 hours. This is a great go to chili that freezes very well, but don’t worry if none actually makes it to your freezer because well, I somehow manage to destroy the entire crock in only a few short days! There is no self control when it comes to me and chili…but hey….at least it’s ORGANIC! « PIZZA! Vegan and Gluten Free BBQ Pizza that is!